Manicotti has long been one of our family favorites. It’s jam packed with a rich cheese filling, it’s brimming with delicious Italian flavor and it’s oh so satisfying. The perfect main dish any day of the week! This is one my favorite recipes that has been in my recipe book and made in my home countless times over the last 8 years. I originally saw the recipe on Food Network and have made my own adjustments, you can follow the link below to view the fully original recipe. Who knew a vegetarian dish could be so good? I actually prefer this over lasagna. I usually serve it along with Parmesan or lemon chicken (so there goes vegetarian =) and a side of steamed brocolli, but if you aren’t up to preparing a big meal this manicotti is filling enough to be a meal on it’s own. 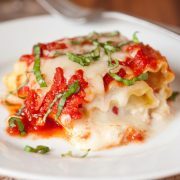 This is cheesey, flavorful, generously filled pasta drenched in a simple yet incredible marinara sauce. Basically it’s comfort food at it’s best. 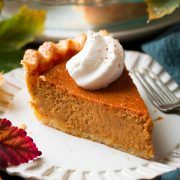 To sum it up, it’s simple, satisfying and a family favorite. Note: the photo posted above is a half batch, prebaked and not fully covered in sauce (so you could see what the manicotti actually looks like). I often do a half batch for my small family. Sometimes I will do the full batch and freeze some. You could even do two half batches in two 8×8 pans and freeze one and immediately bake the other. For the frozen one thaw it overnight then bake in a cool (not preheated) oven at 350 for 55 minutes. Yum yum, all that saucy goodness! Overload of marinara sauce right? 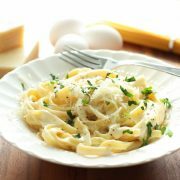 This has been one of my go-to recipes for years! 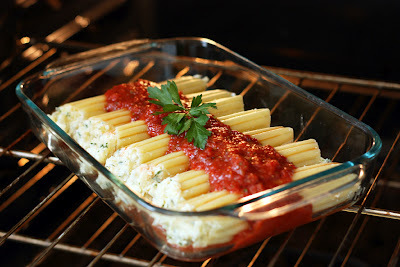 Manicotti noodles are jam packed with cheese and smothered with a homemade marinara sauce. A classic Italian dinner you need to try! Preheat oven to 350 degrees. Cook pasta according to directions listed on package and drain. In the meantime prepare Manicotti filling, in a large mixing bowl, using a fork blend together ricotta cheese, eggs, parsley, a little salt and pepper. Stir in grated mozzarella and parmesan cheese and mix until well blended. Divide cheese mixture evenly among the 14 manicotti noodles stuffing each one full (I just do this using clean hands, I hold one hand over the bottom opening of the manicotti noodle, then press cheese mixture into the noodle and slightly pack it in until the cheese mixture fills to opposite end). 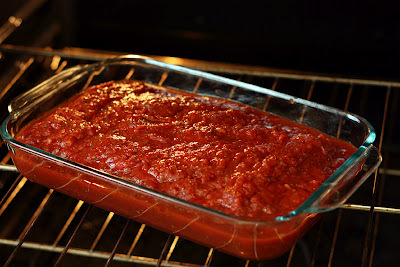 Align noodles in a single layer in a 13x9 baking dish then pour marinara sauce evenly over filled manicotti noodles. Bake in preheated oven until cooked through, about 45 minutes and serve warm. Heat olive oil in a skillet over medium heat. Add garlic and saute 20 - 30 seconds until lightly golden. Add in crushed tomatoes, basil and parsley and let simmer while preparing pasta and filling, about 20 minutes.